Maxilead Metals are one of the largest family owned and operated scrap metal recycling companies in the North West. With over 20 years experience, Maxilead Metals are scrap metal recycling specialists and are proud to provide an extensive range of recycling solutions to help your business actively contribute to the sustainability of natural resources and the protection of our environment. Our £3.5 million, state of the art recycling centre ensures that we offer a comprehensive range of recycling and waste management services – from the recycling of ferrous metals, non-ferrous metals and cabling to WEEE recycling, skip hire and scrap metal collection. Our commitment to the continuous development of our premises and people has ensured that we remain at the forefront of the metal recycling industry. Our enhanced and flexible infrastructure enables Maxilead Metals to offer metal recycling services on a national level – as complete business packages or as adhoc services tailored to suit your needs. 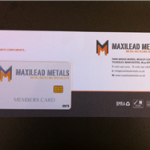 Are you a Maxilead Member? Do you know about the Cash Ban?